Step aboard the luxurious Al Andalus, the Palace on Wheels of Spain, for an unforgettable journey filled with rich history where you will feel like royalty throughout. 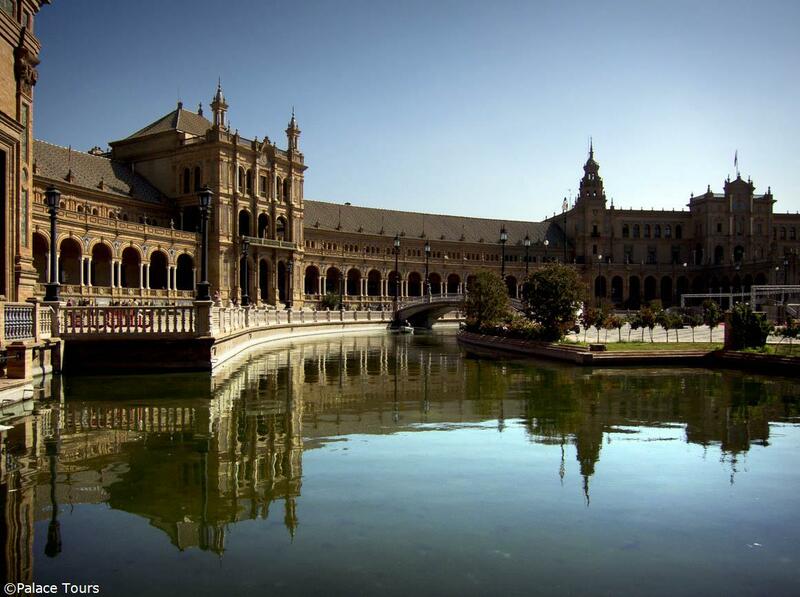 In this delightful journey you will visit the captivating cities of Seville, Huelva, Merida, Plasencia, Monfrague, Toledo, Aranjuez and Madrid. Learn all about the fascinating culture and history of these places while exploring Museums, touring Natural Parks and enjoying a boat ride along the way. While the train travels from one town to the next, just kick back, relax and enjoy some exquisite meals prepared by our onboard chefs. Spend free time as you wish in each city and get a chance to shop or learn more about each destination. A wonderful and incomparable luxury tour! Rendezvous at Hotel Alfonso XIII in Seville at 10.30am. Luggage will be transferred to the train while we visit the capital of Andalusia, boasting the most extensive historic city centre in Spain, home to the Gothic Cathedral, its bell tower named Giralda, the Royal Alcazar and the General Archive of the Indies. Return to the Al Andalus and welcome cocktail with the crew. Lunch onboard while travelling to Zafra. Visit this historic town that preserves significant traces of its rich past. Dinner and overnight in Zafra. Just as every day, we begin the journey with a delicious buffet and a la carte breakfast while the train takes us to Mérida, capital of Extremadura, where we will spend the day. Visit an Iberian pig farm, the Lake Proserpine, Milagros Aqueduct and the town’s Roman temples. After lunch, we will discover the National Museum of Roman Art, the Amphitheatre and the Roman Theatre. Free time before dinner. Journey to Cáceres, an impressive Roman-origin city with an almost intact historic city centre listed as a World Heritage Site by UNESCO. Guided city tour followed by lunch and free time. Optional activities include a visit of Vostell Museum or Helga de Alvear Foundation. Dinner onboard and overnight in Cáceres. We will travel to Monfragüe while having breakfast to enjoy a morning in nature, visiting this National Park home to over 200 species of vertebrates, and many more that winter here or can be seen during migration to other latitudes. After the tour, enjoy lunch and entertainment onboard. Dinner and overnight in Monfragüe. The Al Andalus train will take us to Torrijos, from where we will board our coach for Toledo. Visit to the Visigoth capital listed as a World Heritage Site by UNESCO, an "Imperial City" where the Christian, Muslim and Jewish cultures coexisted for centuries. Once we have lunch, there will be free time to get embraced into Toledo’s enchanting spell. Back at the train and while having dinner, we will go to Aranjuez, the Royal Site of the Spanish Crown since the 16th century. After enjoying our last breakfast onboard, we will visit the town of Aranjuez, with its magnificent Royal Palace and extensive manicured gardens, before visiting the historic winery Carlos III. Back on the train, and over lunch, the Al Andalus will take us to Madrid, where the trip ends. Accommodation onboard in Grand Class Room. A la carte and buffet breakfasts every day. All dinners and lunches, with the finest cuisine aboard the train or in top restaurants (including wine, water, soft drinks and coffee). Traveling toiletries bag courtesy of Renfe Viajeros (with amenities and slippers). Free mineral water available in the cabin’s minibar. Activities on board: music and live performances, parties in the pub car, show cooking and cocktails, dancing, etc. Tickets to museums, attractions and shows. Luxury coach accompanying the train along the trip. Two Renfe train tickets with a 50% discount: one to the starting point and the other back from the end of the tourist trip. Newspapers and magazines on board. Multilingual guide throughout the tour. Excellent crew available (Expedition Leader, guide, waiters, cooks, technicians, etc). Any items not specifically mentioned as "included"
Up to 30 days before departure: refund less 15% of total cost. Between 30 and 15 days : refund less 25% of the total. Between 14 and 5 days: refund less 50% of the total. Between 4 and 1 day(s): refund less 80% of the total. Less than 24 hours or failure to turn up: No refund, 100% of the total is payable. Cancellations should be intimated by FAX to the corporate office in Miami FL. The above times are based on local time of the destination where the tour is provided. In order to provide enough time for processing cancellation, guests need to add 3 business days to the above timeframes. An administration fees of 15% on any monies to be refunded to the client will be charged prior to refund. 1How big are the suites? A standard suite is 6.72m^2. A superior suite is 8.4m^2. 2What size are the beds in the suites? 3What kind of meals are provided on this tour? 4Is there a dress code on the train? The dress code is casual, although you may dress up for dinner if you would like. We suggest packing comfortable walking shoes and layers of clothing, since the temperatures do fluctuate from day to night. 5What is the difference between a Standard and Superior Suite? The Superior Suites are spacious and elegant and combine the comforts of the 21st century with the original appearance of this historic train. Ample space distributed between bedroom and bathroom. Two meter long double bed which can be turned into a sofa during the day. Possibility of adding an extra bed for a third passenger. Equipped with safe, varied minibar, wardrobe, luggage rack and climate control. Comfortable and spacious bathroom, with hairdryer and a varied set of welcome items. The Standard Suite is a charming room, which retains the dimensions and Belle Epoque charm of the original compartments. A bedroom and bathroom layout. Two single beds which can be turned into armchairs during the day. Equipped with small minibar, safe, wardrobe, luggage rack and climate control. Functional bathroom with maximum use of its space, equipped with shower and a hairdryer. 6What does my trip include? • Accommodation in Standard Suite compartment on the train. • The best food in dinners and lunches at top restaurants or on the train (including wine, coffee and spirits). • Breakfasts with buffet and menu. • Music and entertainment in the Pub coach. • Programmed excursions with entrance to museums, cathedrals, cloisters, etc. • Luxury coach accompanying the train all the way. • Daily newspapers and magazines. • Multilingual guide throughout the tour. • An excellent team at your disposal. • Accommodation in Superior Suite on the train. • Option of enjoying two private dinners/lunches in your compartment. • All non-alcoholic beverages requested at any time throughout the trip. • Transfers: including two Renfe transfers, one to take you to the starting point of the tour and another one to take you back from the end point of the tour. 7Will I have internet connection on the train? The Al Andalus train does have wifi in the lounge of the train, although the signal is not strong and may not reach outside of the lounge car. (The signal is also best when the train is stationed.) You may use the computer in the lounge provided for guests' convenience, or you may connect to the train's wifi using your personal laptop, tablet or device.